CarGurus has 30,264 nationwide 4Runner listings starting at $1,500. 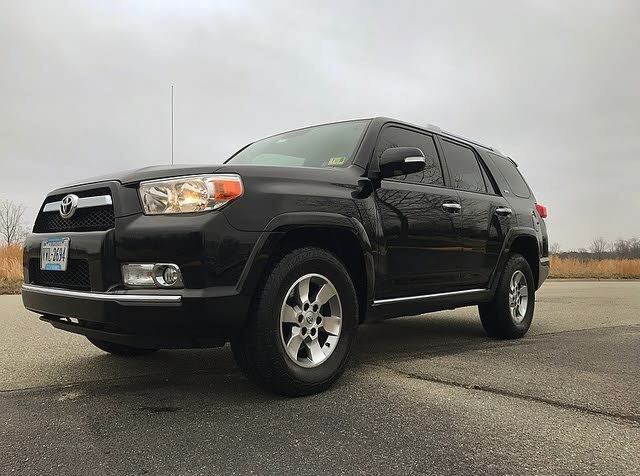 Coupled with a car-like ride, trail-rated drivetrains, a sturdy V6 and up to 7-passenger capacity, Toyota's reputation for reliability carries the 2012 4Runner to new heights as an able 4WD companion with road manners and good economy. This 4Runner suffers from the same cramped third row, sometimes too-light handling and mystery stutter of the previous models in its generation and continues to neglect its V8 potential for 2012. Toyota intends to prove you can be all things to all people with a V6, and they're doing it right with the tech-infused 2012 4Runner. The top-shelf Limited affords exceptional car-like road manners while adding a certain secret agent appeal to the weekly fishing trip. The purebred Trail promises to conquer any terrain and get you to a loo on the other side, and the base SR5 offers the best of both worlds in a happy compromise. A full 28 years since this affordable midsize off-roader's inception, the fifth-generation Toyota 4Runner enters 2012 with a few new standard additions in the multimedia department and, by popular demand, a newly optional manual transmission for the SR5 and automatic running boards for the SR5 and Limited. Everything else about this great outdoors explorer remains unchanged until 2013, when it is scheduled for a refresh. As has become more recently apparent however, the 2010 overhaul caused an interesting new problem that so far hasn't been addressed by Toyota, despite conflicting reports from dealers. Perhaps the 2013 refresh will get to it but drivers are hoping for a fix sooner rather than later, even though all reports indicate no further damage will result from the company's snafu with a sometimes stuttering transmission. Not every 4Runner gets confused with certain paved road conditions, sending the wrong signal to the transmission and causing the stutter, but every 4Runner from the base SR5 on up does now feature satellite radio connectivity with 90 days on the house, USB/iPod connectivity, Bluetooth streaming music, hands-free cellular connectivity, a shark fin antenna and a multi-function steering wheel to put all those controls at your fingertips. Tech-savvy as the 2012 4Runner has become, the transmission issue is an ironic reminder this is a true ute not built for those pansy paved paths. Take it out for a day on the beach—literally, get all in that sand, surf and salt—and the transmission handles like a champ. The gadgets Toyota included are to help you get somewhere no man has been before, and when you come across civilization, those gadgets kick in again to help find someone to cook your haul. For more of those handy gizmos when you're far away from home, Toyota offers the 2012 top-shelf Limited with a new 6.1-inch infotainment display standard, integrating the satellite radio with iTunes-tagged HD radio, navigation, some cellular text-to-speech compatibility and 3 free years of Toyota's Entune services. This system coupled with Entune, which is optional for the SR5 and Trail as well, opens up a world of voice-recognized possibilities to find the best fuel price, get movie tickets, reserve a table at a restaurant near you, avoid traffic, check the weather and so much more, as well as control your cell phone. Aside from that, there's nothing all too surprising about the 2012 4Runner if you're already introduced. The base SR5 and top-shelf Limited are still offered in rear-wheel (RWD) or 4-wheel drive (4WD), the trail-rated and aptly-named Trail is expectedly limited to 4WD, and only the SR5 now offers a 5-speed manual, whereas the rest of the lineup is still relegated to a relatively smooth 5-speed auto-manual only. A ride set for 5 is still the standard, but the optional third row adds room for 2 more folks who don't mind it being a bit cramped back there. The 2010 V6 carries over unchanged as well, and that pesky 4-banger is gone for good, but some drivers are still waiting for a more robust V8 option that Toyota so far has no plans to include. Whether you're a weekend warrior or a full-time mountain mover, the 4Runner offers able power in a variety of configurations to set the mood. Toyota wisely dropped the 4-cylinder option for 2011, leaving a lone 4-liter V6 good for 270 hp and 278 lb-ft of torque available well below the redline. A tow hitch and wiring harness are included across the board, but despite its rugged body-on-frame construction, brake hill holder, 4WD descent control, rear limited-slip differential and ample power on paper, the 4Runner is limited to just 5,000 pounds of towing capacity. For 2012 the SR5 gets the option of a 5-speed manual, but it and the other trims are otherwise offered with a 5-speed auto-manual. The SR5 and Limited are both available in RWD as well as 4WD, but only the Limited offers full-time multi-mode 4WD controlled by a mechanical center locking differential. The part-time 4WD systems offered in the SR5 and Trail afford a rear locking differential, hi-lo electronic gear selection and auto-locking hubs. The purebred Trail goes a step above with features like Multi-terrain Select and Crawl Control for its 4WD system. If you were waiting for fuel economy figures to tell you which 4Runner you should get, sorry to say you won't find much of a difference. RWD models fetch 17 mpg city/23 highway, and 4WD is just 1 mpg off that highway figure for 17/22. Acceleration could be a sticking point with 1 full second between the RWD and 4WD models at the 60 mph finish line, but in reality the difference between the RWD's 7.2-second time and the 4WD's 8.2-second time probably wouldn't be noticed. Of course that's without the 4Runner's standard Eco mode engaged, which is probably the way most drivers will use the 4Runner, given the Eco mode's minimal fuel savings for all that power dampening. The 2012 4Runner offers a surprisingly smooth ride despite its truck-based chassis, and coupled with light low-speed steering, the 4Runner makes itself into more of a car than a sport ute. Unfortunately that light steering also lends to a disconnected feel between the driver and the road, but simultaneously gives an off-road advantage against kickback. Its V6 powerplant solidifies the 4Runner's purpose as an adventurer's thrill companion, having ample power for conquest, but not the precision or acceleration speed demons demand. As such, the interior is built to suit long-term passengers in all but the optional third row, which is a bit tight for adults. Otherwise the interior is easy to clean, comfortable and spacious enough for elbows attached to tall people and their tipsy cups. An overhead cubby and door pockets keep handy things dry and generally safe. Road noise is a small issue for some, but the 4Runner's oversized knobs make it easy to find something more appealing if the road's song is not your cup of tea. Your typical all-season radials adorn 17-inch alloys on the SR5 and Trail by default, the Limited fetching 20-inch alloys instead, but the Trail offers even more for those who regularly choose the road less traveled, including the sunroof to bathe in its glow. In addition to standard skid plates and optional all-season radials, the Trail has the option of a Kinetic Dynamic Suspension System, which disconnects the front and rear stabilizer bars for improved maneuverability on extreme expeditions under 40 mph. The Limited, on the other hand, offers adaptive suspension dampers standard in addition to another option for better road manners. Its available X-REAS Sport Enhancement Suspension system softens bumps and improves cornering confidence in high-speed situations. In sum, with the Trail uniquely equipped for off-roading and the improved on-road manners of the Limited, this leaves the SR5 as a suitable compromise for most mixed driving needs so long as you don't mind body roll and delayed driving dynamics. To be sure, the 4Runner's largely hard-plastic interior is a turnoff in some markets, but we know how you like to keep a clean car—or at least not sit in mud—and "going mudding" isn't exactly a clean thing to do. 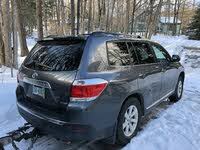 By the way, the Trail gets mud guards and water-resistant upholstery standard, just in case I gave you any ideas. In any case, the interior is probably best described as nakedly simple yet warmly inviting in a "let's get messy" sort of way until you move up to the Limited, which sports more of an executive secret-agent appeal. The base SR5 comes well-equipped with cloth upholstery, reclining rear seats, heated power-adjustable mirrors, foglights, air conditioning with rear vents, cruise control, rear parking sensors, full power accessories, power rear window, tilt-and-telescoping multifunction steering wheel, Bluetooth audio streaming/cellular connectivity, an 8-speaker sound system complete with CD player, auxiliary audio jack, iPod interfacing via USB and for 2012, XM satellite radio can be pumped through that system for 3 months on the house. Every 4Runner is also endowed with a roof rack, cargo tie-downs, 12-volt outlets in the dash as well as the cargo area, and a universal transmitter for security systems and garage doors. Above the SR5 the Trail also includes that sunroof, water-repellant cloth upholstery and mudguards as mentioned before, alongside powered front seats, a rear-view camera and an auto-dimming rear-view mirror. The Limited antes up with leather upholstery, heated front seats, dual climate control, remote keyless entry, push-button start, automatic headlights, powered lumbar support, integrated rear-view camera, HD radio and Toyota's Entune system for all those top-secret missions to your favorite fishing hole. Most of the otherwise standard inclusions are also available as options to any other trim, but results may vary by region. Other notable options include a 50/50 split-folding third-row seat for a total of 7 passengers, a voice-activated navigation system, a sliding rear cargo deck capable of holding up to 440 pounds and automatic running boards for all but the Trail. About 45 cubic feet are usefully available inside, double with the passenger rows folded flat, but if you need to entertain more than haul, opt for the Party Mode to boost the bass and pump your music primarily through the liftgate speakers. The 2012 Toyota 4Runner performed well in its latest crash tests, snagging the top Good rating for both frontal offset and side impacts, and a second-best Acceptable on the roof strength test. The 4Runner can take a bit longer than expected to stop, though, with the SR5 floating 122 feet and the Trail equipped with off-road tires using 140 feet before coming to a standstill from 60 mph. Such a performance is about average for midsize SUVs, but more toward the long end of the spectrum. Helping the 2012 4Runner achieve those figures is a broad complement of safety equipment including antilock brakes, stability control, traction control, electronic brake-force distribution, brake assist and so-called Smart Stop Technology to round out what Toyota calls its Star Safety System. Additional safety considerations include active front head restraints, knee airbags, front-seat side airbags and a roll-sensing full-length set of side curtain airbags. Every 4Runner fetches rear parking sensors, but only the Trail and Limited get a rear-view camera by default—though it is an option for the SR5 as well. Also otherwise optional is the Limited's Safety Connect system via Entune, Toyota's emergency response and detection system in case of theft, breakdown or collision. 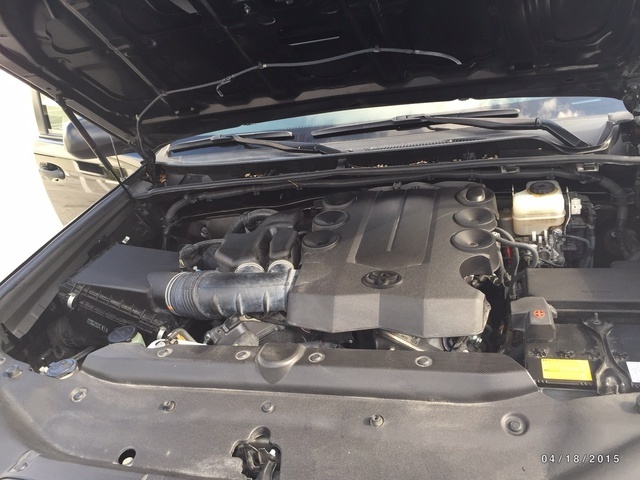 Owners of the 2012 4Runner are thus far very pleased, but it's still a bit too early to tell if the transmission stutter is as prominent in this year as it has been for the 2 before it. In any case it would seem Toyota improved the suspension dynamics between last year and this, since more drivers this time around are calling the 4Runner's ride exceptionally more car-like than drivers of previous years. Touting a comfortably floaty feel, the 2012 4Runner—especially the Limited—takes to railroad tracks and potholes as if they don't even exist. The road noise is a bit much for some, but most drivers call it "minimal," while others don't even bother mentioning it at all. Drivers also praise the easy use of Toyota's Entune and navigation package, with high marks for the 4Runner's HD radio. Should you choose this beloved crossbreed and end up with that transmission stutter after a few thousand miles, one driver has a solution: Let your foot off the brake for about 2 seconds before pressing the gas to give the transmission some time to consider its options. This technique seems to get rid of the issue completely and puts the "fun" back in the 4Runner's function. What's your take on the 2012 Toyota 4Runner? 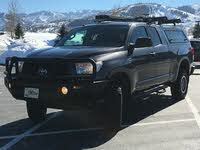 Users ranked 2012 Toyota 4Runner against other cars which they drove/owned. Each ranking was based on 9 categories. Here is the summary of top rankings. Have you driven a 2012 Toyota 4Runner?